Born and raised in Southern California, painter Alex Couwenberg creates images that are inspired by the elements indigenous to his surroundings. From Los Angeles, Couwenberg’s work references and suggests the aesthetic associated with mid-century modernism, car culture, skateboards, and surfboards. Not to leave out, paying homage to the historical styles of post-war art making associated with Los Angeles and Southern California throughout the 1950’s, 60’s, and 70’s. 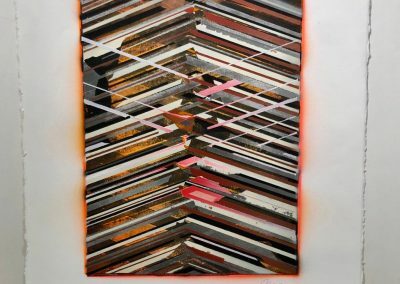 Couwenbergs paintings give a nod towards the Hard-edge abstractionists, the finish fetish, and the light and space artists. 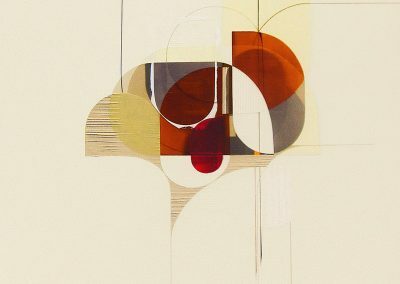 Not content to replicate, he uses the sensibility of Eames-era design and hard-edge geometric abstraction as points of departure for creating paintings. His process, an additive and reductive series of moves and passes, creates multilayered environments that are deep and sensual. He harnesses these ideas into harmonious results, reflecting the visual landscape of his environment. Couwenberg’s paintings have been shown in several solo and group exhibitions throughout the United States, Canada, Europe, and Asia. His work can be found in numerous public, private, corporate, and museum collections around the world. Recent museum acquisitions include the Long Beach Museum of Art, Lancaster Museum of Art and History, Laguna Art Museum, Crocker Museum of Art, and the Daum Museum in Missouri. 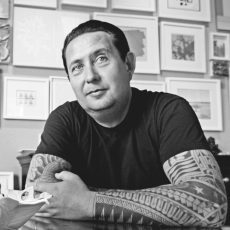 In 2007 Couwenberg was awarded the prestigious Joan Mitchell Foundation Award for his achievements in painting and was recently featured as the subject of Los Angeles based film maker Eric Minh Swenson, which focuses on the artists life and studio practices. 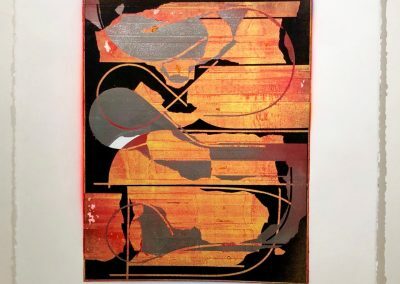 Couwenberg recently exhibited a body of paintings in a two person show along with his mentor Karl Benjamin in Los Angeles. The show was part of the Getty Museums ongoing “Pacific Standard Time” project highlighting Southern California artists and their contributions towards art making. The Kostuik Gallery is excited to introduce our September Exhibition of new paintings by Alex Couwenberg and Curtis Cutshaw. Geometric Generation combines accomplished painters who express addictive and reductive paint techniques to create formal compositions of movement and textures all through highly skilled paint application unique to each artist.California based Alex Couwenberg pays homage to the historical styles of the visual language used by hard-edge, geometric abstractionist, the Finish Fetish and Light and Space artists who were influential in shaping the aesthetic of Los Angeles and Southern California art during the 1950’s to the 1970’s. His paintings reference and suggest influences from custom car culture, surfing, skateboarding, and music, at the same time glossed over with the sensibility of mid-century modernist design. 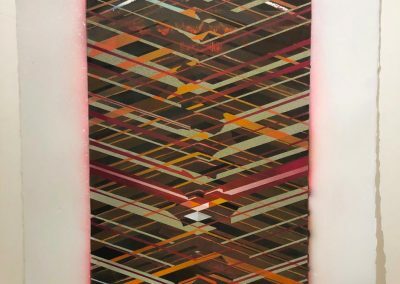 Over that last decade, Alex Couwenberg as developed a signature style of painting where he builds upon layers of paint while also exposing his under painting. 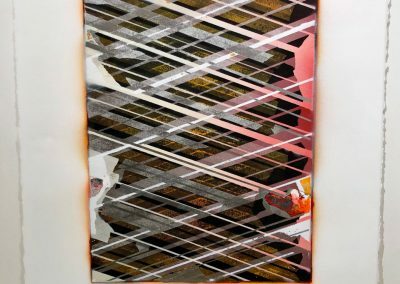 His process, an additive and reductive series of moves and passes, creates multilayered environments that are deep and sensual. 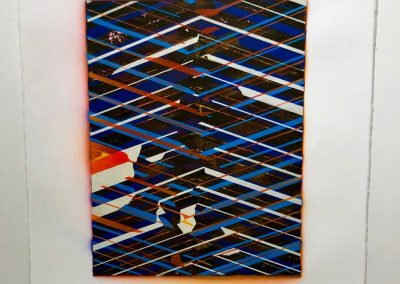 His technique is partly a reflection on the artist’s relationship with his personal and cultural history as well as an intention to find and create a middle ground between expressionism and hardedge abstraction. Couwenberg’s 2014 paintings continue to explore “process” and the “moment” through tightly controlled compositions of paint and mark making, creating images that are inspired by the elements indigenous to his surroundings. Couwenberg’s work gives a nod and pays homage to the historical styles of the visual language used by hard-edge, geometric abstractionist, the Finish Fetish and Light and Space artists who were influential in shaping the aesthetic of Los Angeles and Southern California art during the 1950’s to the 1970’s. 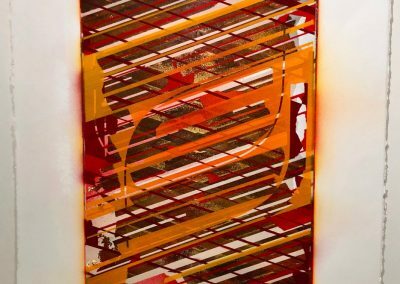 His paintings reference and suggest influences from custom car culture, surfing, skateboarding, and music, at the same time glossed over with the sensibility of mid-century modernist design. 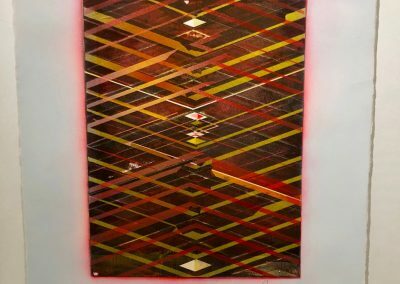 However, not intending to replicate, Couwenberg uses Eames-era design and hard edge geometric abstraction as points of departure for creating his paintings. 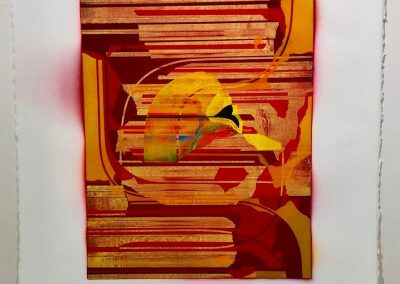 He harnesses these ideas into harmonious results: asymmetric compositions of color with beautiful surfaces that can be dynamic or quiet and elegant, presenting a kind of contemplative soliloquy reflecting the visual landscape of the world around him.